The user who has not use their sim at least 3 months they can enjoy teletalk bondho sim offer 2019. All inactive user can get this offer. 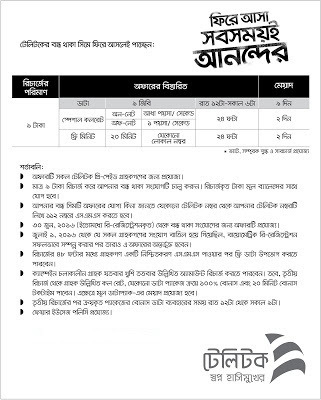 To know your Teletalk bondho Sim offer 2019. You are eligible or not eligible just follow this option. To check the offer customer can send free SMS from any Teletalk number in the following system. If you eligible for this offer you just need to recharge 9 taka only. This balance add your main account. After activation your bondho Sim you can enjoy special data offer. Every 9 taka recharge you get 9 GB Data. 9 Taka recharge you get 9 GB Data. Every 9 Taka recharge you get this offer. Usable time 12 AM - 6 PM. Teletalk bondho sim offer user also get special call rate offer. To enjoy this offer you need just recharge 9 taka. Teletalk - Teletalk .5 Paisa/Sec. Teletalk - Other Operator 1 Paisa/Sec. You can also get special minute offer. You get 20 minute which is usable any local number. Recharge 9 taka you get 20 minute. This special minute validity 2 days. At first you need to recharge 9 taka to enjoy this teletalk bondho sim offer. Only Prepaid user can get this offer. After recharge within 48 hours user get a message then you can enjoy your Data bonus. This campaign user can unlimited get this offer @ 9 taka recharge. After 3 rd recharge user can also get 100% data bonus of any data pack buy and get 20 minute bonus talk tim. After 3 rd recharge the Data pack usable time 12AM - 9 AM. 3% SD AND 15% VAT will be applicable.